Expecting a washroom, Howard is surprised to find himself in a vast desert. He is even more surprised when a saurian humanoid tries to impale Howard. One misstep later and Howard’s attacker dies, impaled on his own sword. The next person Howard encounters is equally non-human but considerably friendlier. Awp the Hant grants Howard the ability to understand the local languages. This won’t make what follows any less chaotic, but at least Howard can understand what’s going on. Captured by the Meticulous Victors, Howard is smitten with a fellow prisoner, the Redborn Alaiya. Alas for Howard’s romantic ambitions, he manages to offend Alaiya almost as soon as he sets eyes on her. Even more inconveniently for the would-be romantic, he is left behind when Alaiya and the Hant manage to escape the Victors. Fortune favours the bold but not half as much as it seems to favour the amiable bumbler. Howard isn’t without talent, but in this book he seems to get by on luck. Far be it from ME to criticize Howard for his amiable bumbling. Pots, kettles, all that. At least Howard is conscious that he falls well short of the heroic ideal. He’s no John Carter, no swashbuckler. He is not adept with sword; he does not enjoy his recurring brushes with death. He’s courageous, but in a stolid way: having yet again gotten himself into a fix, he sees no way out but forward. The world in which he finds himself is ruled by enigmatic beings who seem to be encouraging endless conflict and battle, for reasons that are unclear. Perhaps this will be explained in the next book. This could lend itself to a grim-dark tale; the author resists that temptation. Rather, he’s written a soft-edged, amiable, secondary-world sword and sandal fantasy. Dangers abound, but one senses that Howard always manage to save himself, if in the nick of time. He will stand, brush himself off, and amble towards the next adventure. 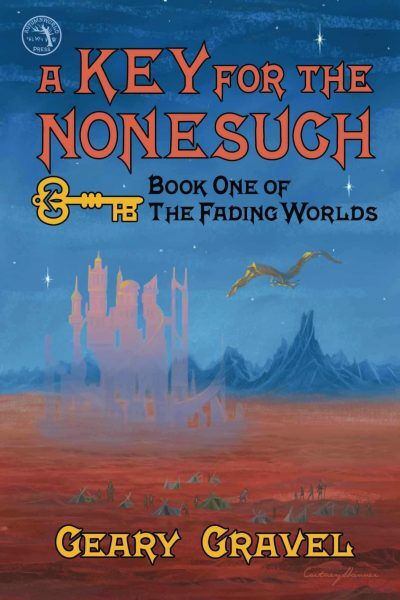 A Key for the Nonesuch is available here (Amazon). It does not appear to be available from Chapters-Indigo. Amiable... but not outright comic? As Pellucidar pastiche? As for romantic ambitions - the setup implies that the hero should be old enough to know better. I take it that stepping back through the magic door was never an option. Was there ever a washroom? Or in a vast desert... does that matter? Next question, in a vast desert, where is food and water? I assume it's explained.